You rely on your car to get you where you need to go, from work to errands to picking up the kids at school and back home again. If you ignore your car’s routine maintenance needs, you may end up with your car in an auto repair shop for longer than you expected. One car issue you should never ignore is changes in your brakes. Your brakes are essential for maintaining your safety on the road, as well as keeping your fellow motorists safe. 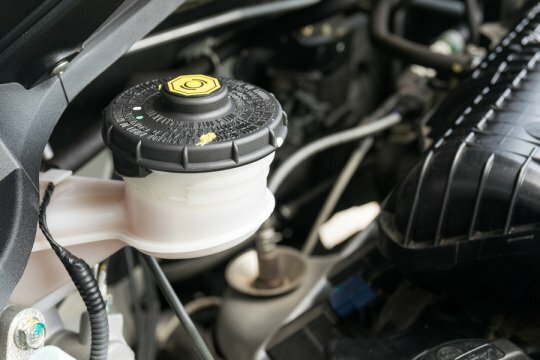 Problems with your brake fluid can cause them to not work at all, which is just one reason why it’s important to know the facts about brake fluid. One of the potential causes for low brake fluid is worn brake pads. Check your owner’s manual to see how often you should have your brake pads replaced, or ask your mechanic if you notice that your brakes are making strange noises or functioning differently. Brake fluid should be replaced when the pads are replaced for the system to work properly. Low brake fluid may also be a sign that you have a leak. If your brake fluid system is allowed to get completely dry, your brakes will cease to work. Stepping on the brakes all the way to the floor won’t make the car stop, which is a dangerous and scary situation for you and your passengers. If you suspect you have a brake fluid leak, don’t wait to take your car to the repair shop. Look under your car where you normally park to see if there are any puddles of fluid. Brake fluid should be mostly clear, or may be slightly brown if it has not been replaced in a long time. Not all leaks will actually create puddles, however, as some leaks will only create wet spots on the undercarriage of your car. You need the expertise of an auto mechanic in White Oak who can evaluate and repair the site of your brake fluid leak. Call Murray’s Auto Clinic at (240) 450-2478 to schedule an appointment for your vehicle to be evaluated. Your car maintenance safety depends on it.